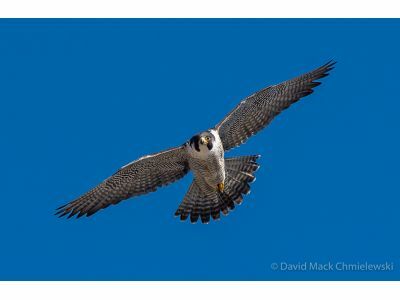 On Tuesday, April 19, join the Audubon Society of Kalamazoo from 12 – 1 PM on the top deck of Kalamazoo Parking Ramp #3 (Alamo Theater Ramp) to view the Peregrine falcons. The parking ramp can be accessed from Portage Road, just south of Michigan Ave. (Parking fees are based on visit duration. Alternatively, you might find a free spot on the street and ride the elevator (or walk) to the top of the deck). The falcons are incubating four eggs. There is usually a bird (just out of our view) in the nest box and the other one may be seen flying nearby. If it is a warm day, they both may be flying at the same time. Binoculars are recommended. A spotting scope will be available for participants.